Configuration of log walls depends a lot on the climate in which you live. Conestoga offers two different insulation packages. Both take advantage of thermal mass and the Everlast™ Log advantage. The result is less air infiltration that provides a more comfortable energy efficient building that saves money while you enjoy your cabin. Thermal mass describes a material’s ability to absorb and store heat energy. Materials such as concrete and brick are high density materials. Therefore, requiring a lot of heat energy to change the materials’ temperature. These materials are described as having high thermal mass. Materials such as wood and timber are lightweight. These materials therefore have low thermal mass. Thermal Mass’ concept in building design and construction describes how the log walls of the building provide “inertia” against temperature fluctuations. 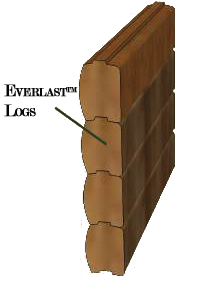 By their very nature log cabins and log homes differ from other construction techniques because solid wood has both moderate R-value (insulation) and significant thermal mass. The single wall option is perfect for cabins that are in moderate climates and/or for seasonal use. We recommend this option for year round residences in cold weather climates. 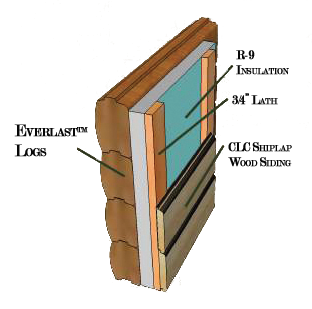 This package adds a layer of insulation and interior log siding to a single wall structure. This technology will meet or exceed the most stringent energy code requirements.